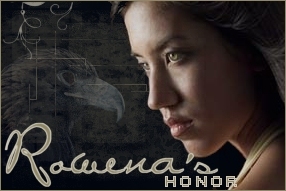 An honour presented to an exemplary Ravenclaw, who honours his or her house in its highest way. The winner of this award is truly a magnificent example for the rest of the house -- he or she is kind, respected and accomplished. This award is the BIG one. It is given out very sparingly and it normally takes a Ravenclaw at least seven years to earn it. It's extremely rare for someone to get it in their sixth year. It's practically unheard of for it to be given out in someone's fifth year. However, our winner this year is only a fourth year. She has shown more Ravenclaw spirit and dedication this year than I have ever seen from any of our staff. When she was made Head Prefect, I told her that she had a long line of successful Ravenclaws ahead of her that she would have to fill the shoes of. She has gone above and beyond what I ever expected from her. With everything she had going on in RL, I would have been more than understanding if she needed another admin fill in as HP for a while, but not only did she get all of her work done, she did so in an exemplary manner. Every time I speak with our prefects, at least one has something positive to say about her. She is the epitome of Ravenclaw and I am so proud of her.